Thanks to all those who have tuned in and also those who have provided a nice rating and positive feedback about the show on iTunes, or sent us notes here or on Twitter @LeafMatters . Those of you who know my appreciation for the history of the great sport of hockey will also recognize my respect for the legends of the game—individuals I have watched since I became a hockey follower in the late 1950s and have also written about here on many occasions over the past three plus years that VLM has been in existence. 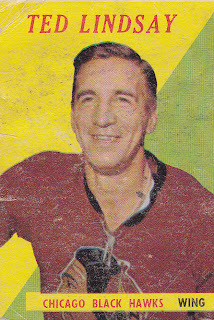 One of the ex-players I have chatted about here on occasion (there is also an old interview with him that I did thirty years ago here—hopefully the link still works if you go t the right-hand side of this site and look for Audio interviews- Vintage) is the legendary Ted Lindsay. Few players have better reflected what hockey means to many of us than the now 87 year-old former Red Wing and Blackhawk winger. He was tiny, physically, by today’s standards, but so skilled and tough as anyone who has ever played the game. He wasn’t called “Terrible Ted” for nothing. No one had to fight Lindsay’s battles, but he was so much more than a fighter. He played with Sid Abel and Gordie Howe to form one of the finest lines in hockey history. He and Montreal Hall-of-Famer Doug Harvey (a hated rival at the time, back in the 1950s) had the temerity to try and start what they referred to as a “Players Association”. They were simply looking to obtain some basic rights for themselves and their colleagues in the old six-team NHL—a league clearly run with an iron first by the owners of the day. Players had little in the way of "rights". For their efforts, players like Lindsay, Harvey and Maple Leaf forward Tod Sloan were all traded. Most of the “malcontents”, as the owners tried to label them at the time, were shipped off to the worst team in the league in those days—the Chicago Blackhawks, the league's perennial doormats. (Harvey, though, was ultimately dealt by Montreal to the Rangers.) Ironically, some those traded players, including Lindsay, helped build the Hawks into a stronger club, and the Hawks ultimately won a Cup in the spring of 1961. After retiring from the Hawks after the 1959-’60 season, Lindsay made a remarkable comeback to the NHL after a four-year absence, when he returned to the Motor City to play with his beloved Wings during the 1964-’65 season. He retired again after that season, but returned to the organization yet again as General Manager in the late 1970s. His motto was “Aggressive hockey is back in town”, and he certainly made that happen. So here is an individual who has seen all sides of this “issue”—how players are invaluable in the popularity of the game, how they are “treated” and what they “deserve”. He was the original “union organizer” for NHL players, and they all owe him a tremendous debt for his ground-breaking efforts more than fifty years ago. How well-regarded is Lindsay? The NHLPA has re-named the former Lester B. Pearson Award and named it after him. It goes to the individual voted "most outstanding" NHL'er by his fellow players. Now, he says he’d like to see the players allowed a free vote on a new contract—something I’ve advocated here in recent weeks. He doesn’t appear to be taking sides (here is the story, via ESPN), while expressing an understanding for both parties. He also gently admonishes fans and current players who continue to be so condemnatory about Gary Bettman, who (as I’ve also said here often) Lindsay suggests is simply doing his job—fighting on behalf of his employers, the NHL owners. This is a frustrating situation for all concerned. I genuinely believe players want to play, and most owners truly want to have the game they pay for back on the ice. Heck, fans may be most frustrated of all. But here's a thought: maybe, in addition to the players and owners meeting directly—without Bettman and the Fehr boys controlling the atmosphere and agenda, which is the interesting suggestion that arose after the failed mediation talks on Thursday—it would make sense to also include some of the individuals who made the game what it is today. There are a lot of names I would consider putting in that room, but Lindsay’s name would be among those at the top of my list. I agree with you Michael, what could it hurt?? Sadly I think the Fehr brothers and the PA executive have quietly and very-effectively brainwashed the players to the point where many of them simply can't think for themselves. Pardon the expression, but can't these guys "DO THE MATH"? Sadly, many players rely on their agents to advise them, yet the agents lose nothing during a lockout. If anything they want the NHLPA to fight for every advantage. The Fehr brothers probably don't want to risk the players meeting with the owners directly, and will politely decline the invite. In turn I think the players are afraid to speak with the owners alone. They are worried the owners will try to get them to question/challenge Fehr, or that they will damage their relationship with the owners such that the owners will shun a player or think twice about signing them to a lucrative contract. Put a fork in this season, I think it is done. My two cents for what its worth. You may well be right, Don (TML_fan). But I'd like both sides to give it one last shot- and yes, without Bettman and Fehr in the room. Otherwise, as you say, the season is over. The distrust is so deep. When federal mediation fails, there aren't many happy thoughts left. And to be honest, I no longer care about this season. It's too late - it can only be a half season, and then what would the playoffs be, except an even more blatant cash grab than the one both sides are currently bickering over. Winning the Stanley Cup certainly wouldn't have the same cachet. (On he brighter side, if it had only been a half-season last year, the Leafs would have made the playoffs). I just hope that however this impasse gets broken, both sides are able to reach an agreement that won't self-destruct in five years. A shortened season wouldn't be the same, I agree, Gerund O'. And I also hope that any new deal doesn't simply create the same discontent down the road. But with these two sides, who knows? When I was a child, my heroes were hockey players. I loved their gallantry, their guts and their work ethic. I also loved the men who steered the ship. Now that I am in a different phase of my life, I still have tremendous admiration for professional athletes and all those involved on their behalf. My heroes, however, are the people like my husband, a family doctor in a rural region and my sister, a nurse in a rest home and all those who work tirelessly in the service of others. Like so many fans, I simply do not see a side to take in this dispute. I fear a tremendous disservice has been done to all those souls in need of brave role models. Do you know where I think these meetings should take place? I would like to see them held in the lobby of the Sick Children's Hospital, or in a ward treating wounded veterans. Maybe that would change the outcome. I could not agree more, Elizabeth. We live in a time of plenty- for some. Sometimes those that have "plenty" forget they are privileged (yes, most work hard to achieve what they have, whether, in this case, owners or players, but...) and sadly, that privilege becomes a sense of entitlement. Thank you Elizabeth. The best advice either "side" could get, perhaps, is that they are fortunate to even be a) healthy and b) in a position to have the discussion they are having.